On Christmas, my sister and I were talking about Grandma Zimny’s camera. Oddly enough, I had come across this picture a couple of days before and lingered on it for a couple of minutes, mostly because it’s a rare picture of my grandma. As often happens with family photographers, Grandma was always behind the camera but rarely in front of it. This is the grandma I mention in my book who snipped, snipped, snipped obits out of the newspapers and saved them in scrapbooks. I have few memories of her, since she died when I was four years old, but I can still clearly see her behind her camera, snapping away at family gatherings. It becomes clear to me, all these years later, that she was the family documentarian. I write about this in my book in context of her scrapbooks, but I didn’t mention her photography. Her snapping of pictures only solidifies the fact that she saw a need to document and preserve moments. And then she has a granddaughter who becomes a writer, historian, and journalist. My passions for history and journalism are driven by the innate desire to document the past and the present (which quickly becomes the past). In the genes, perhaps? I love this picture on so many levels. For one, just check out the classic 1970s decor! 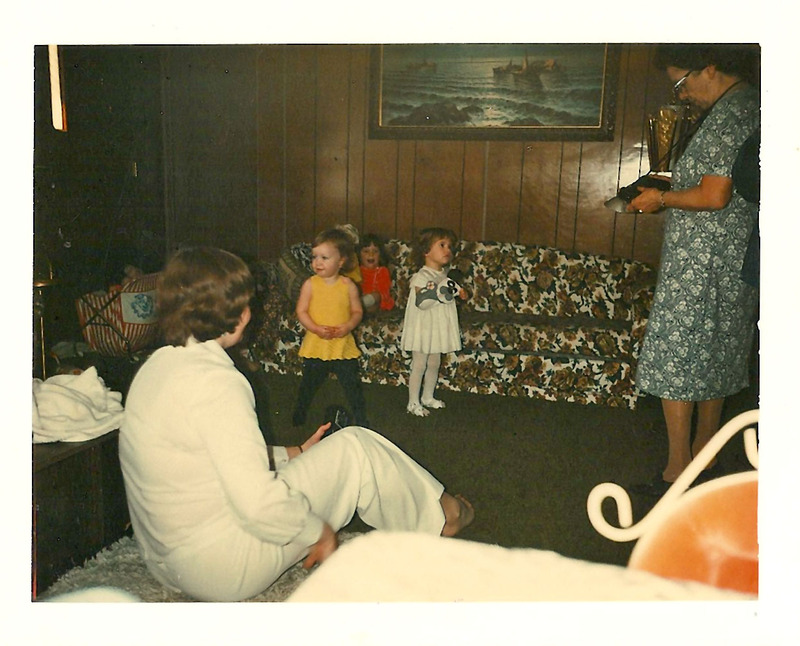 The wood-paneled walls and “lovely” floral couch (look at last Thursday’s blog post for how we upgraded to different floral pattered furniture by 1978!). Note also the green shag carpet and yellow-tinted lamp. The picture was taken sometime in 1976, I believe. That’s me in the fashionable yellow muscle shirt 🙂 My cousin, Karen, is the one in white, looking up at Grandma. We are three weeks apart in age, and we look to be what, about 18 months old here? If so, this would be in spring 1976, maybe for my brother’s First Communion. Whatever it was, it was a photo op day. Karen’s mom, Aunt Linda, is sitting in the foreground and she’s also holding a camera. (I wonder if Uncle Ray was also in on the all-white family outfit that day? Ha!). I’m guessing my mom took this photo, so obviously she had a camera in hand. My cousin, Melissa, is sitting on the couch. Do you think this was the camera Grandma had? What a contraption! What would she think of our ubiquitous, tiny, cameras with instantaneous results today? 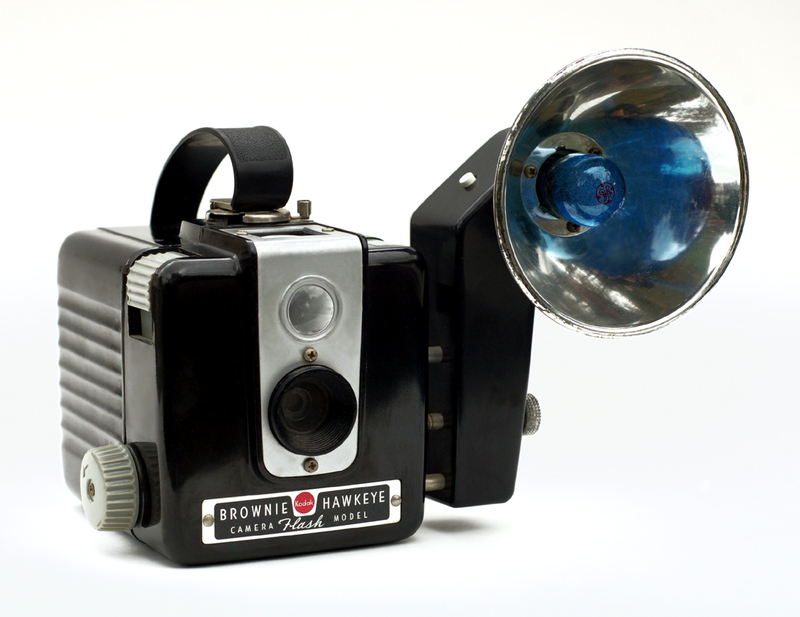 The Kodak Brownie Hawkeye Flash. I’m like your grandma, always the one behind the camera. Rare are photos of me and I feel awkward in front of the lens. Oh, that vintage camera. I need to ask my mom, the next time I visit, whether she still has her similar Kodak and my Dad’s more sophisticated one. I’d love to have them, being the photographer in the family and all. I hope dark paneling like that never comes back in vogue. Our entire house, purchased in 1984, was paneled with dark carpet everywhere. We banished it, except for that which remains in the basement. It was like living in a cave until we were able to rip out the paneling and replace it with sheetrock. It was dark! I can’t believe anyone thought that was a good trend. In the early 1980s Mom and Dad remodeled the house and brought a lot more light into it. Thank heavens!